STATEMAP is part of the National Cooperative Geologic Mapping Program (NCGMP) administered by the U.S. Geological Survey (USGS). The NCGMP, begun in 1993, has dramatically increased the amount of detailed geological mapping in the United States, and has supported new work in all 50 states. Most relevant to the individual states, the STATEMAP program is guided by user-based committees in each state and thus is directly supportive of state and local agencies and administrators. In Indiana, the IGS's Geologic Mapping Advisory Committee meets annually to advise the IGWS in the preparation of its proposal to the USGS. All state-generated proposals are peer-reviewed at the national level, ensuring high quality programs in all states. The Indiana Geological and Water Survey (IGWS) STATEMAP program addresses a variety of societal, scientific, and operational needs within the context of the IGWS long-term mapping plan. Mapping priorities are determined on the basis of several criteria, including the practical need to concentrate mapping efforts in corridors and centers of growth, the distribution of completed and in-progress work, the availability of data, opportunities for inter-agency cooperation, and opportunities for education and outreach. Through their mapping efforts, IGWS staff hope to promote broad-based geological understanding amongst our citizens, our most important customers, and bridge the gap between the highly technical nature of science and the need for general earth information. What use are geologic maps? 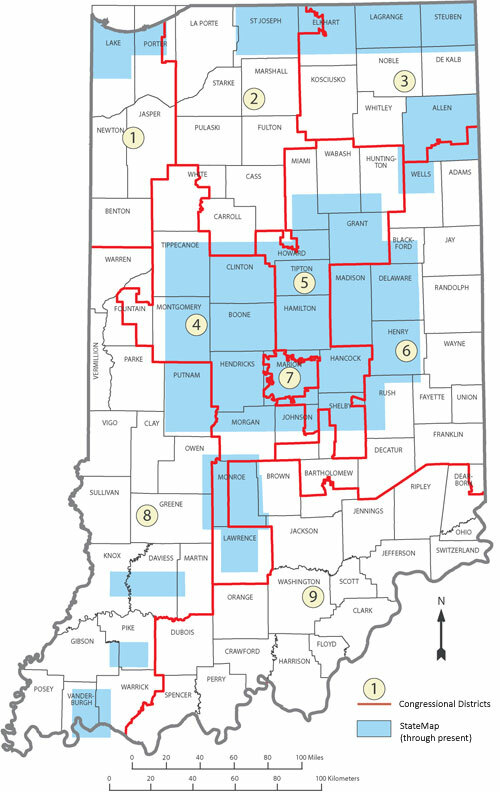 The socioeconomic welfare of Indiana is based in a large part on its energy, mineral, and ground-water resources. The identification, development, use, and protection of these valuable natural capital are gained through geologic mapping and exploration. In its basic and most fundamental form, geologic mapping involves the gathering of information about the distribution of earth materials at or below the surface of the earth, and the 2-dimensional, and often 3-dimensional, spatial depiction of these data. Geologic maps and their accompanying geological records are the principal source of raw and interpreted information for nearly all basic and applied earth-science investigations. The maps are derived from field surveys of the land surface, and from other sources of information such as drilling, mining, quarrying, and excavation records, and geophysical and remote-sensing data. How are geologic maps used? Advances in technology now allow geologists to access, view, and analyze data in ways never before possible. Geographic Information Systems and computer databases permit geologists to make customized, user-friendly, products for end users. Moreover, modern geologic maps are digitally stored for rapid ease of manipulation at minimal cost. These methods of data handling and manipulation in themselves create new mapping challenges, but the users of geologic maps have also asked for a level of detail, interpretation, and specialty not anticipated by previous generations of geologists. To date, the Indiana Geological and Water Survey has mapped at a level of detail suitable for most current mapping concerns only about 20% of the state. In mapping at a scale of 1:24,000 (where 1" on the map is equivalent to 2,000' on the land), specific issues can be addressed such as ground-water resources and sensitivity, mineral and energy resource distribution, geologic hazards identification, and wellhead protection.